While brushing the outside surfaces of your teeth, position the brush at a 45-degree angle where your gums and teeth meet. Gently move the brush in a circular motion several times using small, gentle strokes. Use light pressure while putting the bristles between the teeth, but not so much pressure that you feel any discomfort. When you are done cleaning the outside surfaces of all your teeth, follow the same directions while cleaning the inside of the back teeth. Next you will clean the biting surfaces of your teeth. To do this use short, gentle strokes. Change the position of the brush as often as necessary to reach and clean all surfaces. Try to watch yourself in the mirror to make sure you clean each surface. After you are done, rinse vigorously to remove any plaque you might have loosened while brushing. If you have any pain while brushing or have any questions about how to brush properly, please be sure to call the office. Periodontal disease usually appears between the teeth where your toothbrush cannot reach. If the proper technique is utilized, flossing is a highly effective way to remove plaque from those tight surfaces. 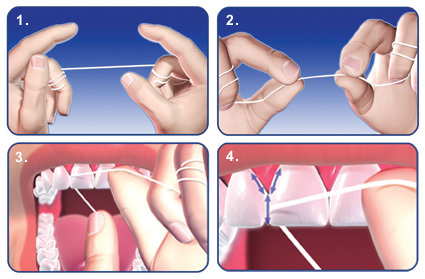 Hold the floss tightly between the thumb and forefinger of each hand. Gently i nsert the floss tightly between the teeth using a back-and-forth motion. Bring the floss to the gum line then curve it into a C-shape against one tooth. Slide it into the space between the gum and the tooth until you feel light resistance. Do not force or snap the floss in to place. Move the floss up and down on the side of one tooth at at time . Remember there are two sides of tooth surface that need to be cleaned within each space. Be careful not to cut the gum tissue between the teeth. As the floss becomes soiled, turn from one finger to the other to get a fresh section. Anti-plaque rinses, approved by the American Dental Association, contain agents that may help bring early gum disease under control. Use these in conjunction with brushing and flossing. Your periodontist is the best person to help you select the right products that are best for you. In the deeper areas that you cannot reach, we will meticulously clean out the gum pockets using our microscopic instruments. This is also called Scaling and Root Planning. For more information on periodontal disease, contact our office in the New York City and Manhattan to schedule a consultation with Dr. Kissel. How Can We Help?We would love to hear from you! Please fill out this form and we will get in touch with you shortly. Strategic Digital Marketing and Design by Firm Media. All rights reserved © 2015. By checking this box you hereby agree to hold Scott O. Kissel, D.M.D., including its doctors and affiliates, harmless from any hacking or any other unauthorized use of your personal information by outside parties. By checking this box, you also agree to receive email communication from Scott O. Kissel, D.M.D.